India holds one of the biggest movie industries in the world which we call Bollywood. However, it is not the only strong point of India that makes people want to visit this country. There are other aspects which have drawn people interest especially travelers. One of them is the authentic foods. You see, almost everything in India are iconic. Started from their lifestyle, culture, and foods. There is a wide range of authentic foods in India worth’s travelling for. Thus, don’t waste your chance to taste various delicacies when visiting India even for a short trip. Kati Roll – this is actually a street food which has been popular in India due to the taste. It is kind of similar as wrap. This food can be found in every city in India. This food involves frying an egg then setting the Paratha (flat-beard which has been familiar in Indian cuisine) on top. It is then added with marinated skewered chicken topping with chilies, onions, lemon juice, as well as sauce. This food is light that you can enjoy to satisfy your hunger before meal time without being too full. Thali – This is kind of full course meal version of India which can satisfy your hunger. This is actually a platter of various Indian dishes. There could be six to twenty different dishes served in one platter. It usually consist of rice, curries, papadum, sambar, pickle, curd, dessert, sometimes, people prefer bread to rice or dal. Every restaurant usually serves different type of thali. However, this can be memorable eating experience for you to try when visiting India. This is a good way to enjoy different tastes from the same plate. Chule Bhature – it is kind of similar with spiced chickpea curry. However, there are also some differences. 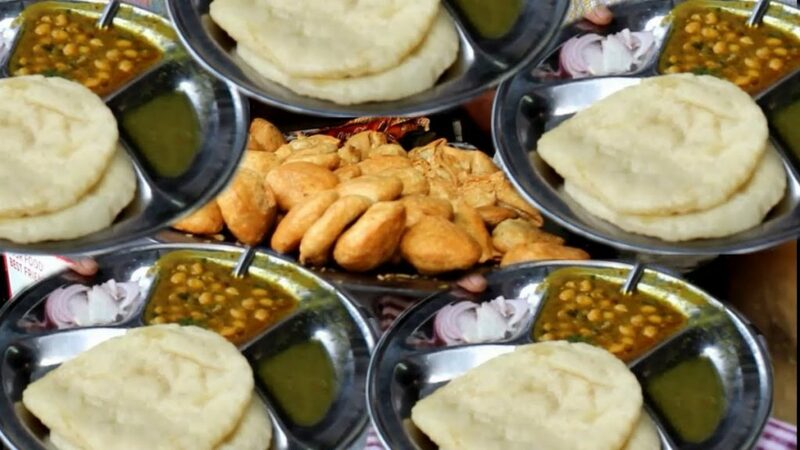 This dish is popular the most in Punjab region. This is basically richly spiced chickpea curry served with Bhature or deep fried bread. Bhature is fried then filled with hot air, making it bloat like a balloon. This dish is usually served with onions, green chilies, and lime wedges. Gulab Jamun – This sweet delicacy deserves a try. This is made of milk solids which are kneaded into a dough. They are then rolled up into balls and deep fried. They are then soaked in a sugary syrup. However, this is not ordinary syrup because it is flavored with saffron, rose water, and cardamom. This is great dessert to enjoy after eating Indian spicy dishes.